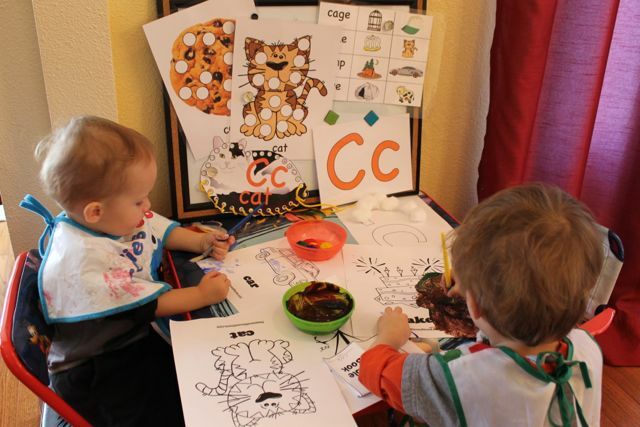 We’re having a blast with our online preschool curriculum at HappyandBlessedHome.com. If you’ve been following along, then you know this is letter C week. 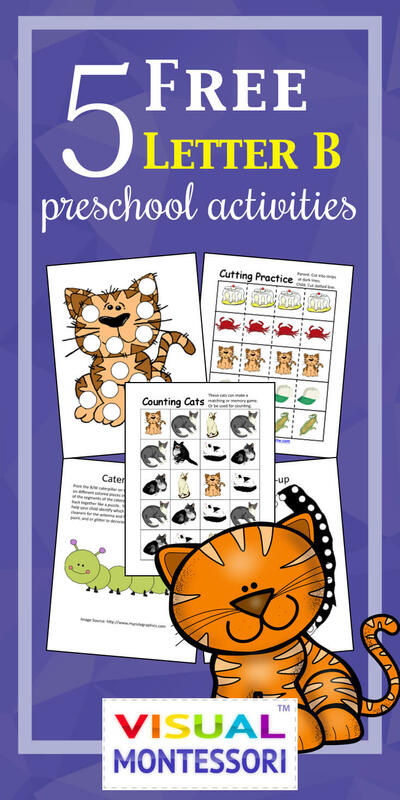 With just a few simple steps, you can enrich your preschooler’s early childhood education with some fun and engaging preschool activities. Best of all? I’ve included 5 Preschool Worksheets for Preschool Alphabet Letter C for FREE! I spent over five years developing a preschool learning curriculum for my two boys and I used the principles of Montessori, and everything I learned about early childhood education, to create a preschool learning curriculum based upon the 12 Sensitive Periods for children between the ages of birth and six years old as outlined in Montessori. 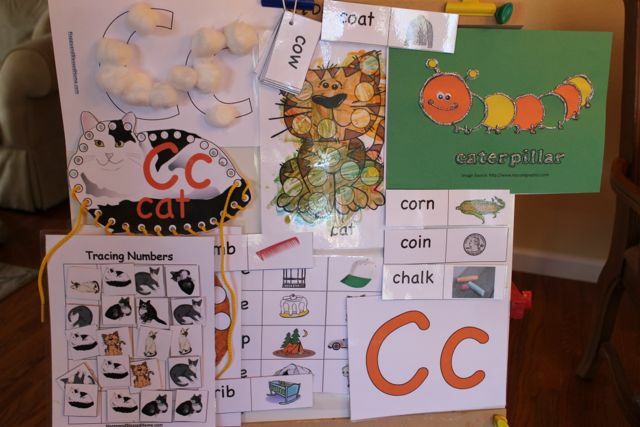 Here I am sharing 5 FREE Preschool Worksheets for Preschool Alphabet Letter C. It’s a sample pack from our family’s preschool at home program, Visual Montessori, based upon the 12 sensitive periods as outlined in Montessori. If you enjoy the FREE 5 Preschool Worksheets for Preschool Alphabet Letter C, you may also like the entire Letter C Printable Pack, it includes 30 activities focused on learning the letter “C” and short words that start with the letter “C”. Click here to purchase the entire Letter C Printable Pack online. To download your free copy of this 5 FREE Worksheets for Preschool Alphabet Letter C with 5 fun learning activities for preschoolers to help them learn about the Letter C. Simply click the yellow button below. This week we started our letter C study with a super-easy craft. I have a 21-month-old and a 3 1/2-year-old and the craft worked great for both children. 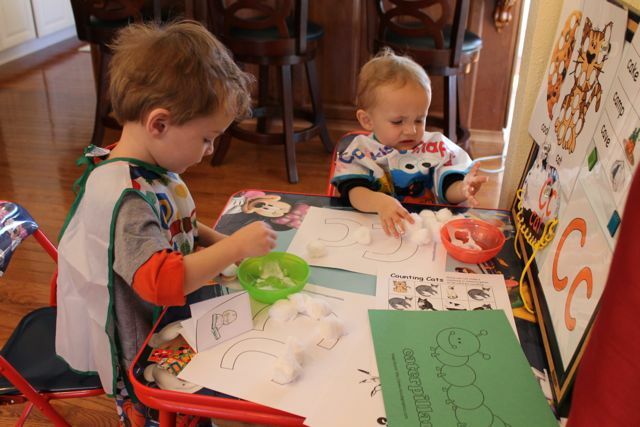 I put some Elmer’s glue in a dish for each child and I let the boys dip cotton balls into the glue and attach them to the letter “C” printed on white card stock. The artwork is included in the TeachersPayTeachers downloadable package along with 32 activities based on the letter “C”. For our Learn to Read Preschool Letter Series, I’ve created FREE Printables for 32 activities focused on learning the letter “C” and short words that start with the letter “C”. Click here to purchase the entire Letter C Printable Pack online. If you’d like to see what we did last year including a table set-up for sensory items and activities for little ones for ages 22-40 months go to the post: Letter C.
It isn’t a part of our downloadable printables but I thought I’d share one of my boy’s newest discoveries – stackable play doh containers. My 21-one month old had a ball collapsing the containers. 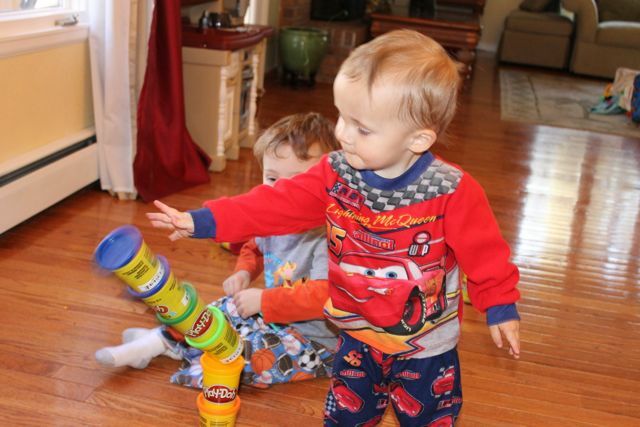 The boys got a ton of laughs from stacking the containers and knocking them down over and over again. Click here to purchase the entire Letter C Printable Pack online. by Carle – A children’s classic. I created some FREE Very Hungry Caterpillar Printables as part of a guest post on Crafts for Kidlets if you’d like some free “Caterpillar” printables. by Carle – This is not a book, but these are so cute I just had to mention them. In my downloadable printables, you’ll find flashcards for 20 words with pictures as well as sight words for your preschooler. 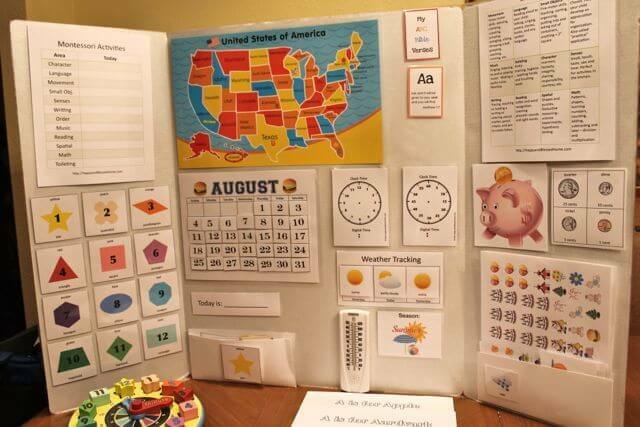 For information about what sight words are appropriate for pre-K, kindergarten and up through grade 3, please see my post, sight words. To supplement our letter C activities for the week, I also use God’s Little Explorers. Our letter C coincides with week 6 in GLE. In God’s Little Explorer’s the bible story for the week of letter C study is the story of Joseph and his coat of many colors; from Genesis chapter 37. My favorite activity (used to emphasize the story) is one where you use a brown paper grocery sack to create a coat of many colors. My boys love to dress up so this activity is perfect for them. Stacie has some wonderful ideas. Click here to learn more about God’s Little Explorers. The boys also enjoy painting. I’ve tried many different kinds of paints but by far my favorite are Crayola 4ct Washable Fingerpaints . They wash out much more easily than any other paints and do not leave a stain on hands or clothes. As part of the printable pack I created a chart of 20 cats. I printed the cats double-sided so each cat has a number on its back . 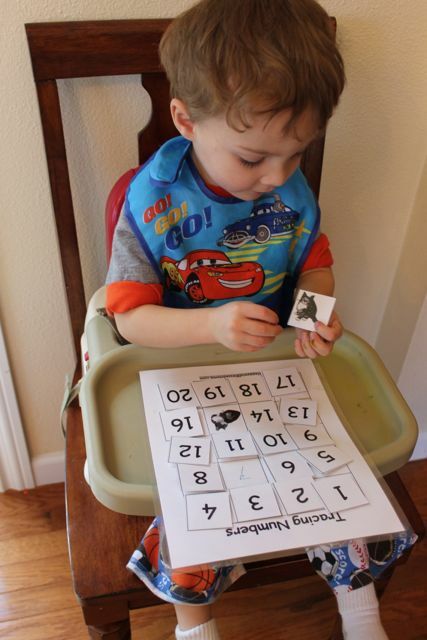 I then asked my son to place the cats in their proper numbered place on the chart with numbers 1-20 for tracing. I used Blu-Tack Reusable Adhesive to affix the cats to the numbered page. He did a great job! I’m an email subscriber, but I couldn’t find the download link in the email! Sorry Ally! I did add it late last night but for some reason it did not work. I think my RSS footer may be getting too big. I’ll e-mail them to you. I am posting Family Fun Friday tonight so when the post goes out in the AM I’ll make sure its in there. Thanks! I am a subscriber and can’t find the link to the letter C packet! Thank so much for providing these! My 3yr old will love these activities!